Bestselling author Sherman Alexie tells the story of Junior, a budding cartoonist growing up on the Spokane Indian Reservation. Determined to take his future into his own hands, Junior leaves his troubled school on the rez to attend an all-white farm town high school where the only other Indian is the school mascot. 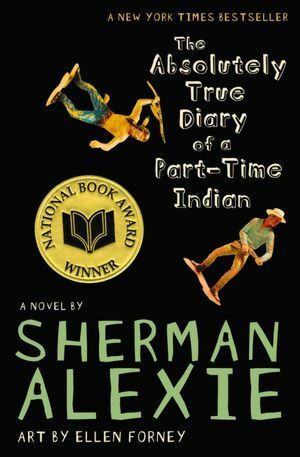 Heartbreaking, funny, and beautifully written, The Absolutely True Diary of a Part-Time Indian, which is based on the author’s own experiences, coupled with poignant drawings by Ellen Forney that reflect the character’s art, chronicles the contemporary adolescence of one Native American boy as he attempts to break away from the life he was destined to live. I read this one last summer and didn’t like the way the author portrayed minorities – Native American and African Americans. There were some lines that really offended me and I felt overwhelmed with the senseless death. But I am always intrigued to read about other people’s experience of this book. Thanks for sharing your thoughts.